If you love the charm and quirks of an old vintage cottage farm home, you will love Dottie's Cottage. New to Home Away and built in 1787, Dottie's cottage used to be an old Bed and Breakfast back in the day. It has recently been renovated and now is a beautiful family home located right in the heart of Center Harbor, NH with gorgeous views of Lake Winnipesaukee. There is so much to do in this area and it is an amazing vacation spot year round for families of all ages. Whether you like to site see, hike, bike, jet ski, paddle board, wake board, kayak, canoe, zip line, segway, fish, etc., you can do that all here in the summer. In the fall, the Lakes Region is one of the most beautiful places in the country for fall foliage. There are train rides that can take you to all the amazing sites. In the winter you are 18 miles away from Gunstock Mountain Resort where you can ski, snowboard, tube, cross country ski, snowshoe, fat tire bike, snow mobile, ice fish, etc. Whether you are the adventure type or just like to take it easy and enjoy the quaint local shops and restaurants, this area has it all and this home is minutes from all of it. The house sleeps up to 15 people and works great if you are travelling with a large group or a couple families. It has 4 bedrooms, (2 with lake views and 40" smart TV's), 2 bathrooms, (1 upstairs and 1 downstairs), 2 kid bonus rooms, an office, a beautiful large family room with a 55" smart tv, a dining room that sits 10 everyday and a well equipped kitchen. Two of the bedrooms are located on the first floor. There are 2 king beds, 1 full bed with a twin trundle underneath that can pull out, 1 bunk bed set that has a twin above and a full bed underneath. In the bonus rooms there is 1 full bed, another full bed and a twin bed. There is also a pack and play available. We love to cook so the kitchen is stocked with all the necessities- Refrigerator, range, dishwasher, microwave, toaster, blender, keurig, regular coffee pot, plenty of pots and pans and baking ware. There are spices and oils in the cabinets and all the essentials you would need to cook nice meals for your family. We make sure there is fresh coffee and half n half in the refrigerator. We also offer gift baskets with snacks and fruit and local goodies upon request. There is a full washer and dryer in the kitchen for your convenience. There is great cable and wifi. A wireless printer is there as well if needed for printing your boarding passes. There is plenty of parking on the half circle driveway. Dottie's Cottage is a very special home and we love it and think you will too. It's a home to create beautiful, fun family memories for years to come. We look forward to having you come stay and experience the Lakes Region here in Center Harbor, New Hampshire. I've always loved the East Coast. I was born in Rhode Island and lived in New Hampshire as a child. I have a lot of family still in Massachusetts. My parents moved us out to California when I was seven and so I've been on the west coast primarily most of my life. I have wonderful childhood memories being back east and spending summers in Vermont and New York with relatives and spending time with my grandparents in Maine. I've always wanted to spend more time there, but didn't know how given my work and family all being in California. Then I had an idea...maybe I can have both! So I saved for 10 years and bought Dottie's Cottage. So why Dottie's Cottage you ask and why Center Harbor? We wanted to find a vacation home that we could have our family all come and be able to all be under one roof. I've always wanted an antique house with charm and character and we wanted to be in Meredith or close to Meredith. Center Harbor is less than 10 min to Meredith and the house sits on top of a hill right in town and has great views of the lake. It fit all of our needs and we loved the house and the area. The reason we named it Dottie's Cottage is because my grandmother "Dottie" loved New Hampshire and Vermont and she is one of the biggest reasons I have such wonderful east coast memories. She passed away last year and I wanted to name this house in her honor. We love this house for so many reasons. We love the location and how you can walk to everything right from the front door. We love the fact that it is up high on a hill with beautiful views of Lake Winnipesaukee. It has a three sided wrap around porch that you can sit on Adirondack chairs and have a cup of coffee and let the world go by. The house is filled with tons of windows and lots of light. The size isn't huge so the house isn't overwhelmingly big, but the fact that it sleeps fifteen people means that my family can all come together and we can all stay there comfortably. Its a perfect home for fun family memories for years to come. You can walk from the house right to town. It's just down the street. The back right burner isn't working at the moment. We are waiting for a part. The other 3 burners work great. We have a sound bar and because it is a smart tv, you can play your own music, Pandora, Spotify, etc. Old New England home with lots of charm. It fit our family perfectly. We are spoiled and could have used one more bathroom but we survived. Thank you Rachel for making it easy by having, laundry detergent, dish soap, and many many other amenities. Lovely New England home with views of the lake. 6 of us spent 3 days here and though it was foggy, chilly, sometimes sleeting and sometimes heavy rain, we were all so comfortable it was just the best time. And Rachel was so helpful in her communication with me in setting everything up, making sure all was well when we arrived, and then following up after. The house is spacious and there are plenty of comfortable beds. The decor is clean and neat, furniture comfortable, and the kitchen has just about anything you could need to fix a meal - we did a huge spaghetti feed one night and pork chops in thyme and rosemary with a side of sage steamed broccoli another night - and all we needed to bring in was the food and spices, and she even has some of the herbs in stock. We had Chinese take out from a place 3 minutes away the other night. Everything worked and Rachel provides a really detailed site manual for just about any information you'd need other than perhaps if a comet landed in the yard. Center Harbor itself is a large area but small village setting. Meredith is only about a 5 minute drive away with all the shopping you'd need, though 3 minutes the other direction from the house is a Dunkin Donuts, state liquor store, Chinese, a couple of other restaurants, and a general store, EM Heath that has a deli for lunch - sandwiches, soups, etc. And if you are new to the area, drive out Rt 25 toward Holderness and climb up Rattlesnake mountain - it's an easy hike but plan a long time up there because the views are so spectacular of Squam and the big lake that you won't want to come down. Had a great time! Host was very accommodating! Accidentally one of our family member left her diamond ring and Rachel ensured it reaches back to us safety. Much appreciated efforts. The house was suitable for our needs and accommodated our family nicely. 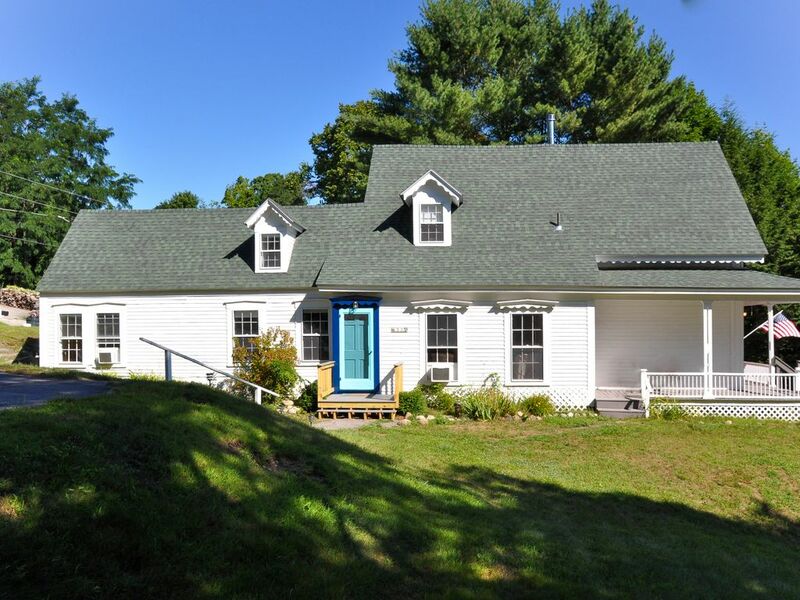 Dottie's Cottage is a nice older home within walking distance of Lake Winnipesaukee. The house is large and recently updated, although not with high end finishes. The kitchen was well stocked with an assortment of mix n match glasses and dishware. It could use some organization, especially in the utensil drawers. The beds were comply and the water for the showers was nice and hot. Location & Accomodations were as expected! There is so much to do here in the Lake Region. If you are the outdoor type, its pure heaven. So many things to do and not enough time to do them. If you want to relax and just walk to amazing local restaurants and ice cream parlors and stroll in and out of local shops, that's here too and within walking distance from the house. You get to do whatever you like to do here in Center Harbor, NH. Just have fun!